If you would like more information on the contest, an entry form or an updated list of the 66 Native Maine Trees and County Champions, please email oxfordcountyswcd@gmail.com, or contact Oxford County Soil & Water Conservation District at 744-3119. 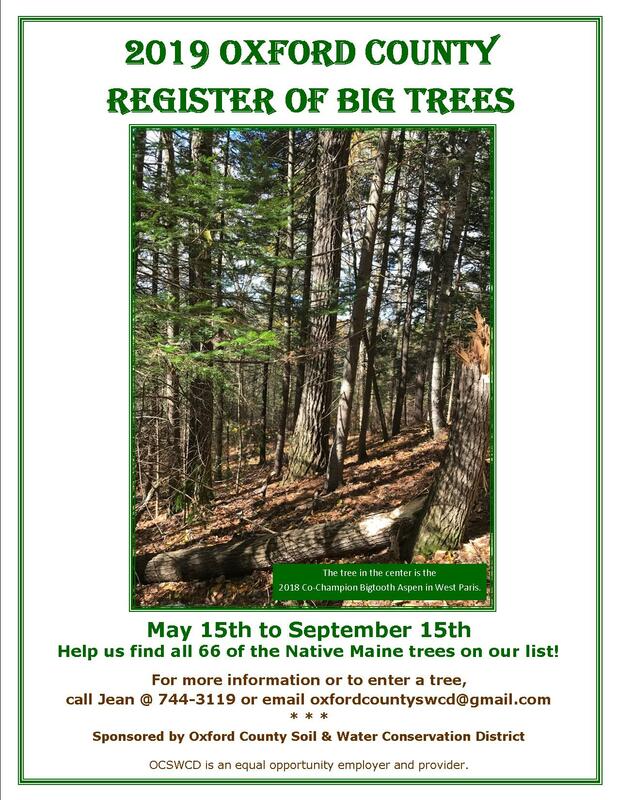 To see all 66 of the native Maine trees, or to get your entry form, click below. Do you need to cross a stream on a timber harvest? Using a temporary skidder bridge can be an excellent way to cross a stream in an environmentally sensitive way. The Oxford County Soil & Water Conservation District rents steel bridges to loggers for use on logging operations. The rental fee is $75/mo. Steel bridges are 25’ long and come in a set of three 4’ wide panels weighing approximately 3800 pounds each. In 2016, Maine Soil & Water Conservation Districts received a grant from the Maine Department of Agriculture, Conservation and Forestry (DACF) to present programs for the Invasive Forest Pest Outreach Project – as well as displays at fairs and other events – in 12 priority counties: Androscoggin/Sagadahoc, Cumberland, Hancock, Kennebec, Knox/Lincoln, Franklin, Oxford, Somerset, Waldo and York. This year we have expanded that outreach to the entire state. The following activities are covered under the grant and are available to you. Municipal outreach through the Maine Municipal Association (MMA) and local municipal associations for municipal officials, public works department personnel and other local government officials through prepared folders and/or regional meetings to provide strategies and draft management plans to address invasive forest pests in their communities. Invasive Forest Pest Information Packets (to be made available at district events/offices) will be produced in all 16 conservation districts in Maine to significantly expand statewide outreach throughout the year. For more information or to schedule a presentation or event in your area, please contact your local Soil & Water Conservation District Office. 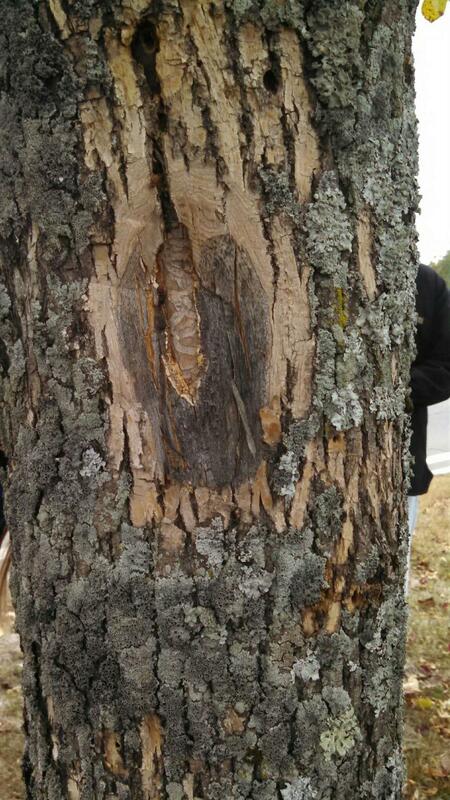 In October of 2017 members from several Maine Soil & Water Conservation Districts traveled to the area around Concord, New Hampshire to see the damage done by Emerald Ash Borer. 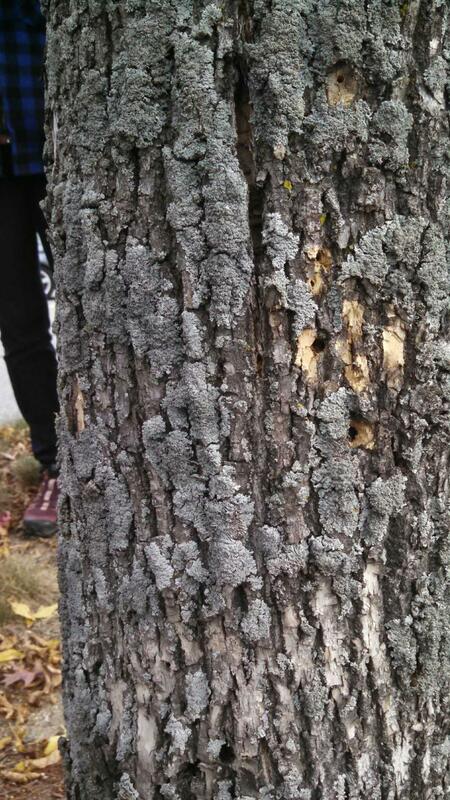 We first toured a shopping mall in the downtown area whose perimeter had been planted with Ash trees- all were damaged and dying (top). We then visited some other areas where the EAB pupa was readily in evidence after being scraped with a draw shave (bottom). The impact on the community was certainly in the hundreds of thousands of dollars but the loss of the Ash goes way beyond the dollars lost. 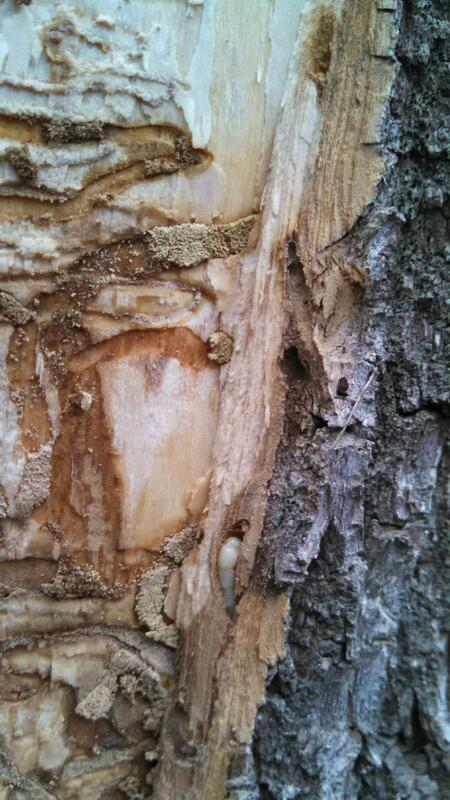 This was a sobering, eye-opening view of the damage done by one small forest pest.